The emotions that glide in and out of the extensively chatty plot initially offer some exasperating theatrics from the two principal actors. But then you realize director Umesh Shukla favours the stagy flavour with a ferocious fervor. There is no attempt to conceal the film’s theatrical antecedents. For its 102-minute running time, 102 Not Out accesses that rare theatre-on-celluloid mood which I thought had gone out of style with B R Chopra’s Kanoon. More recently Umesh Shukla had mined the theatrical tone most successfully in Oh My God and disastrously in All Iz Well. Cleverly Saumya Joshi’s story adapted to the screen by Vishal Patil builds the baap-beta bonding organically, relying on the two actors’ considerable emotional resources to bring to the screen a sense of imminent eruption. Together Amitabh Bachchan and Rishi Kapoor explore the father-son relationship with a gurgling gusto best described as a landmine that has known better days. 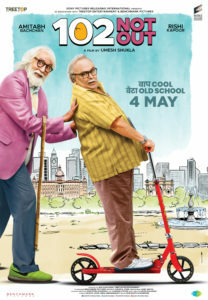 Mr. Bachchan has great fun playing the 102-year old fun father. He doesn’t hold back the emotional outpourings ​of ​a heart bursting with a paternal pride, which won’t allow the son to snivel, grovel, plead and whine before a son who has migrated to a foreign land leaving his father to pine for that one phonecall every 3 months. Rishi Kapoor plays the old emotional fool with a restrain that wouldn’t be a problem on stage. He makes his character’s transparent emotions swell up to ​a​ crescendo and then pulls back just time before gets excessively maudlin. As the masti-khor father Amitabh Bachchan is so clued to his character’s effervescence it felt like he was floating on a substance that man has yet to produce. The two super-accomplished actors ensure the interest-level never drops. On the contrary the dynamics of the drama-on-film are supremely controlled allowing the characters to expand their emotional spectrum without losing the core of humanism that grips the morality tale. With resounding melodramatization this film questions a son’s claim to his father’s affections and wealth, no matter how emotionally and geographically distanced the son may be from his familial home. Don’t grovel before your child for that one tri-monthly phonecall. It is meaningless. 102 Not Out teaches us to find that one rare moment of truth that binds two people together even if they are not meant to be together for keeps.